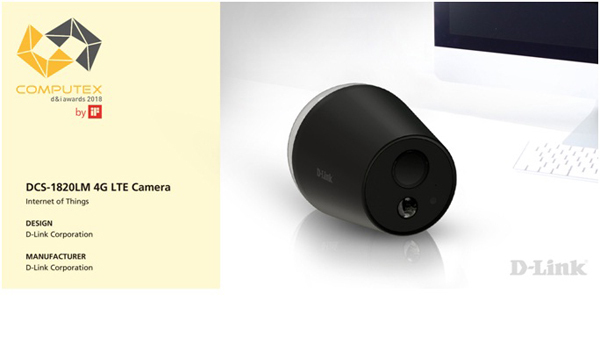 The international networking company D-Link Corporation announced that DCS-1820LM 4G LTE Camera received the Computex d & i Award 2018. DCS-1820LM is also the new winner of the 2018 CES Innovations Award and iF Design Award. The Computex d & i 2018 award, hosted by the Taiwan External Trade Development Board (TAITRA) and implemented by iF Design, recognizes an attractive, innovative and unique design. A jury of six international design experts selected a total of 66 winning entries from 212 entries sent from 10 countries. DCS-1820LM is on display at the Computex d & i Computex pavilion at Computex Taipei, which runs from June 5 to June 9, 2018 at the Nangang TWTC exhibition hall. 0 Response to "D-Link Win Computex d & i Awards 2018"